Posted: April 17, 2015 3:30 p.m.
Students in Canada’s first collaborative, online Master’s of Nursing (Nurse Practitioner) program got together in person for the first time this week in Regina as part of their studies. 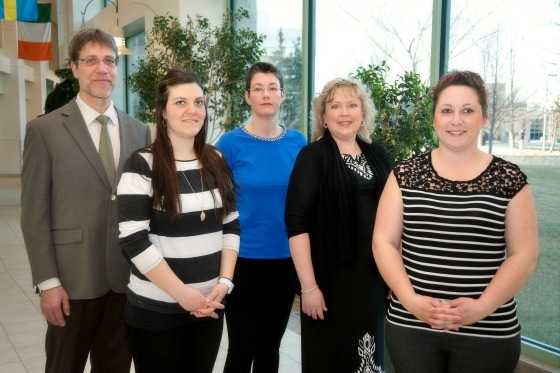 They’re enrolled in the online Collaborative Nurse Practitioner Program (CNPP) – offered by the University of Regina and Saskatchewan Polytechnic. Students are spending time at both the University of Regina and Saskatchewan Polytechnic, and are being exposed to state-of-the-art, high-tech simulation laboratories where they will further develop their advanced practice nursing skills. They’re also getting to meet other students and instructors in person. “It’s important to learn about the people you’re spending two years interacting with, and also getting to meet faculty members,” says Niki Aschenbrenner of Martensville, SK. “You don’t get to know someone’s personality over a computer. By meeting face-to-face, we’re learning about everyone’s sense of humour, speaking styles and quirks. I feel closer to them now,” she says. “This week-long intensive promotes a sense of community among the students,” says Dr. david Gregory, Dean, Faculty of Nursing, University of Regina. “Relationships are important, especially in the online community. But it’s difficult to build a relationship through words only. Being able to meet the other students, and our instructors, face-to-face, and learning about their lives is important. We can be more open with our comments now that we really know who we’re talking to,” says another student, Claudia Pearson of Prince Albert. Given that the program is delivered online, students can complete their Master’s of Nursing (Nurse Practitioner) degree by studying in their home communities. For people whose professional lives are established in their communities, it means they do not have to move to Regina. For students living in Regina, it means accessing their studies from home. “The residency will be an invaluable and transformational learning experience,” says Dr. Netha Dyck, Dean of Nursing, Saskatchewan Polytechnic. The program, launched in September 2014, is taught by both University of Regina and Saskatchewan Polytechnic faculty using the latest teaching-learning technologies. Graduates will improve health care services in Saskatchewan and across Canada – especially in rural, isolated and northern communities, where nurse practitioners often manage the care of patients and their families in primary care settings.